‘Change by doing’ doesn’t require much of selling. Whether it is a salt march, a war or the creation of Facebook, the act triggers a change process – sometimes quite massive. In contrast, ‘change by being’ is relatively less understood. Many people may not even consider it as a legitimate approach for change. And yet, I believe ‘change by being’ is just as powerful an approach as ‘change by doing’ if not more in bringing about a change. 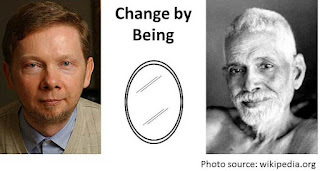 What is ‘change by being’? 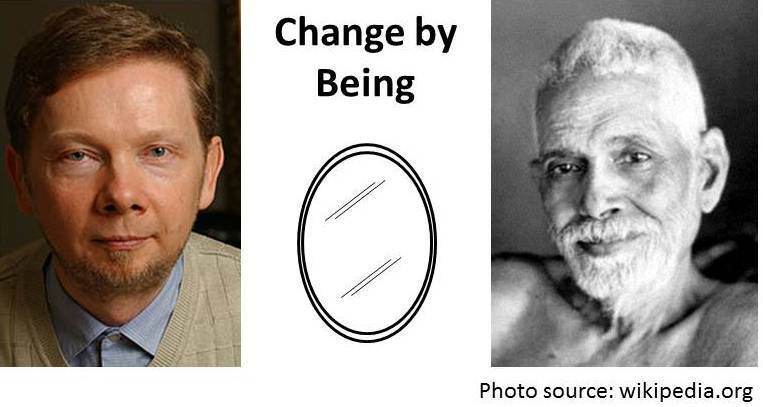 Let’s get a glimpse of it through 2 short stories of Ramana Maharshi and Eckhart Tolle. Did both the stories involve a change? Yes. Did the stories involve an action? Almost no visible action from Ramana or Tolle. So, what is happening here? I don’t know. But I like Tolle’s approach – which begins with complete acceptance of the situation – without being judgmental about it. Perhaps this creates a mirror so clear that the other person sees herself and the futility of the conflict with utmost clarity. That leads to the change. Can anyone become a catalyst by creating such a mirror? Eckhart feels that it needs practice. For most of us, the mirror is tinted – in fact, heavily tinted. With practice it can become clearer. I hope it is like building stamina. Tolle’s story is on page 175-176 of “A New Earth” by Eckhart Tolle. “Catalyst” analogy of David Bohm is on page 173 of “The ending of time” which contains dialogues between David Bohm and Jiddu Krishnamurti. True Vinay - I guess an Innovation Catalyst should also act in the same way - facilitate innovation by just being there. It is important that he does not actively participate in the ideation process - for he may bias the evolution of idea through his own knowledge or opinion. I have always felt this way but I wasn't sure if it is the correct approach - your examples reaffirm my faith in this approach. Thanks Shankar for establishing link to the innovation catalyst role. Hope to hear more stories of your catalyst experiences when we meet. Posting this on behalf my friend, Raja Chidambaram, who is himself a veteran change agent. Dear VPD, I agree with this blog totally. My experience as a consultant facilitating change is that my 'being or my interior condition' seem to be more critical than my skills or knowledge or the methods I use. The statement of Bill O'Brian "The success of an intervention depends on the interior condition of the intervenor" is so true in my experience, however esoteric the statement may sound. This blog points to the kind of inner journey every leader needs to take for being an effective catalyst. Beautiful post. My 2 cents. To be a "catalyst" as David Bohme defines, ironically, it looks like that the person should NOT have any agenda/intention of making a change or "being a catalyst". Many times, a leader or a consultant has an agenda of moving the other person in a specific direction, maybe for a larger goal and perhaps, that's why he has to take more efforts to bring in a change at personal level in others. This brings to an interesting question. Do the "catalyst for a person" and "catalyst for an organization" need to have different properties? Or are they under the same umbrella? Good observation, Ravindra. Ideally, a catalyst should be agenda-less. In practice, the weaker his own agenda the better. You mention that many times the helper (leader/consultant) has an agenda of moving the client in a specific direction. In fact, that is really not required. All he needs to have is a "mirror" where the client sees the current reality as is. As a result the client identifies the direction himself. I thought Krishna showed such a mirror to Arjuna in the battlefield. Similarly, Jiddu Krishnamurti created such a mirror for Indira Gandhi in October 1976 in a one-on-one meeting at Pupul Jaykar's house. Years later Indira Gandhi told Pupul Jaykar that the meeting started a movement in her mind eventually resulting in ending of emergency. In the mirror Indira Gandhi saw herself "Riding the back of a tiger". Pupul Jaykar narrates this in the chapter Riding the back of a tiger. Now, about being a catalyst for an organization vs an individual. At an interaction level, there are only 2 types: one-on-one or a group interaction. The group could very well be the CEO and his leadership team. Can one create a mirror where the group sees the current reality as is? Before a group can do that, there needs to be a common ground. In fact, David Bohm devoted later part of his career developing a method called Dialogue whose objective is to create such a common ground. In a dialogue a group gets into a type of conversation where listening to one's own thoughts is more important than listening to others and where silence is a legitimate way of participation. A dialogue needs a facilitator or a catalyst. So I would put both catalysts under the same umbrella. A similar method was developed by psychotherapists called Solution focused brief therapy. Insoo Kim Berg describes it in her interview. The therapy sessions are used both at individual and at group levels. Thanks for your views. Nice points, made me think more. Regarding your examples, I am not sure how we classify the methodology Krishna followed. Perhaps, he followed every tool in the book. In Geeta, the first chapter gives ramblings by Arjuna where he gives all kinds of reasons not to fight, and Krishna, just like Tolle doesn't say a single word. At the end of the first chapter, Arjuna has given up his bow and resigned. Then the remaining part of Geeta (17 chapters) are the teachings of Krishna, of the same thing in different ways and detailing them as required. Arjuna asks a few questions here and there, and finally convinced, picks up his bow. So, in a way Krishna counselled Arjuna in many ways possible to get the "desired" result, of course Krishna "wanted" Arjuna to fight, so He had an agenda. Definitely, this was not just "change by being". Krishna tries it initially, but on failure, resorts to a severe counselling mode. But curiously, in this counselling he does not directly/explicitly handles any of the initial/actual concerns of Arjuna, On the other hand, He speaks in generality about aim of life, how to achieve it etc and in the process Arjuna gets his answers. So, maybe this is another way of showing the mirror. IMHO I guess, whatever is happening in all these examples is not exactly the same (trivial?). In Raman Maharshi's example, the lady felt happy just by being in the company of Ramana Maharshi and the internal happiness and the serenity of the Maharshi was contagious and changed her unknowingly. In this process, perhaps, just presence of Raman Maharshi was enough. In Tolle's example, Tolle was aware of what he was doing (by not doing anything). He knew that the lady was agitated and deliberately gave her time to vent her frustration. Fortunately, she realized the noise she was making and Tolle's silence gave her a hint that maybe her frustration was unwarranted. In Arjuna's case, when the above two techniques didn't work, Krishna had to counsel him in different ways. Thanks for listing and explaining the methods used in being a "catalyst for a group". In you experience, do you think "being a catalyst" for a group is easier than "being a catalyst" for a single person? Or is it other way or equal? Ravindra, It is interesting that you mention what Tolle was doing... the act of not doing anything? Is "not doing" something one can really do? or only be? You are saying Krishna had an agenda. I didn't realize it. Also I thought one of the things Krishna shows is a grand mirror where Arjuna sees "Vishwaroop Darshan" - world as is. However, I am not a BG expert. I could be wrong. On catalyst for a single person vs catalyst for a group - I feel that the prerequisite for both is the ability to create a crystal clear mirror. In my experience that is the difficult part. If we assume that a catalyst amplifies an intent of the client then for a group we can ask, is there a group intent? Or does the group "own the problem"? Dr. Abhay Bang experienced this when realized that not much progress happened until sickle cell disease was researcher's / Govt's problem and not a community owned problem. He narrates this in a paper Community participation in research and action against alcoholism. In my case, a corresponding question is - is becoming innovative a genuine intent of the client? or is it fake - more to talk about it with peers / bosses etc? Hence, I consider my client's competitor as my best partner. He is more influential in convincing my client that he needs to be more innovative. Found this interesting exposition of Ramana on his method in this article on Silence and satsanga edited by David Godman.